Some say the Bible is outdated and needs to be revised to stay relevant. Others argue that the stories in it are merely fables and re-writing it for modern times would be a waste. 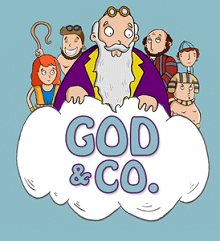 ‘God & Co.’ aims to please both parties of skeptics and throws in a little animated humor along the way. Why read the actual Bible stories when you could just watch funny 4 minute versions of them? Growing up as a kid in a Christian school, I often found myself dozing off in class when our teacher would pull out the Bible. Not that I didn’t enjoy a good story now and then, but just the fact that they were full of vocabulary that was hard to understand. Sure, God and Co. isn’t by any means a real replacement for actually reading the Bible, but it certainly is more entertaining. Moses, the sacrifice of Issac, and Noah’s ark were never this interesting before. Here we have a their re-interpretation of Noah’s ark. By taking the glorification out of the task we can easily see how ridiculous the story is if taken literally. What do you mean taken literally, if you took it literally, GOD destroyed the world because sin was so rampant. This wasn’t as funny as I hoped. 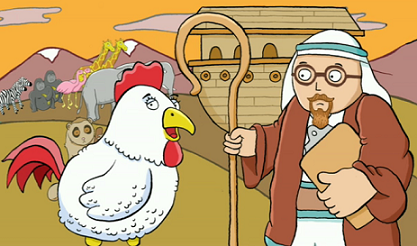 If this is a bible story where in the bible did it show animals talking and cussing cuz if it was not in there then why the creator of this clip making fun of it that is not something to play with.